If we are going to talk about games in cancer then we might as well start with the biggest name for EGT in oncology — David Basanta. As a case study, let’s look at the progression of three models that he was involved with. Basanta, Hatzikirou & Deutsch (2008a) wanted to understand the transition from benign to metastatic cancer. To become metastatic, it was believed that individual cells had to acquire motility so that they could move from their original site into say the circulatory system and then spread distantly across the body from there. But biologists believed that a cell faced a trade-off between growing and moving. So Basanta et al. (2008a) formalized this intuition as a two-strategy Go-vs-Grow game. They then analyzed this game, in part through simulation, and suggested how some hypothetical treatment would have to affect the game matrix so that it might hinder the emergence of motile cells. Around that time, there was also a lot of interest in the role of Warburg effect in metastasis. It was believed that the acidity caused by the anaerobic glycolysis made tumours more likely to invade. So Basanta, Simon et al. (2008b), added a glycolytic strategy to their go vs grow game. They then analyzed the resulting three-strategy game and showed how it formalized the intuition that the presence of anaerobic glycolysis makes for a more invasive (for them: more motile cells) tumour. A number of years later, I jumped in and in Kaznatcheev, Scott & Basanta (2015) we looked at a different avenue for extensions of the go-vs-grow game: spatial heterogeneity. After all, if we’re interested in motile cells for their role in metastasis then the intuition is that it only matters if we have motile cells near boundaries like blood vessels or basal membranes through which a tumour can enter a more global domain. Motile cells in the tumour body should matter less. But these two regions of the tumour have different local neighbourhood structures. We tried to approximate this edge effect and suggested that the more easily to sample (at least with liquid byopsis) tumour body can hide the more aggresive ratio of motile cells at the tumour edge. Now, of course, one could easily imagine continuing this escalation of complexity and ‘realism’. One could ask about how glycolysis matters in the spatial setting (as I ask at the end of this post and as I think Patrick Ellsworth might have answered since). This progression to more complicated and detailed models is a common pattern among EGT models in oncology. In fact, Marco Archetti even argued (or, at least, that’s how I understood it) at the Lorentz Center in Leiden that this is a healthy progression for the field. The fact that we are building more complicated models is a sign of a healthy, growing subfield. We should continue to confer models with more strategies and more complicated games (like non-linear ones). The proliferation of progressively more complicated models is certainly a sign of a growing subfield. But as cancer researchers, we know that growth doesn’t need to imply health. I think we build more complicated and detailed theoretical models because we can and because it’s relatively straightforward; not because they’re needed and not because they are having a clear impact on cancer research (outside mathematical oncology). This is due to another common aspect in our literature: our games rely almost exclusively on biological or clinical intuition. The exact game parameters are seldom measured. 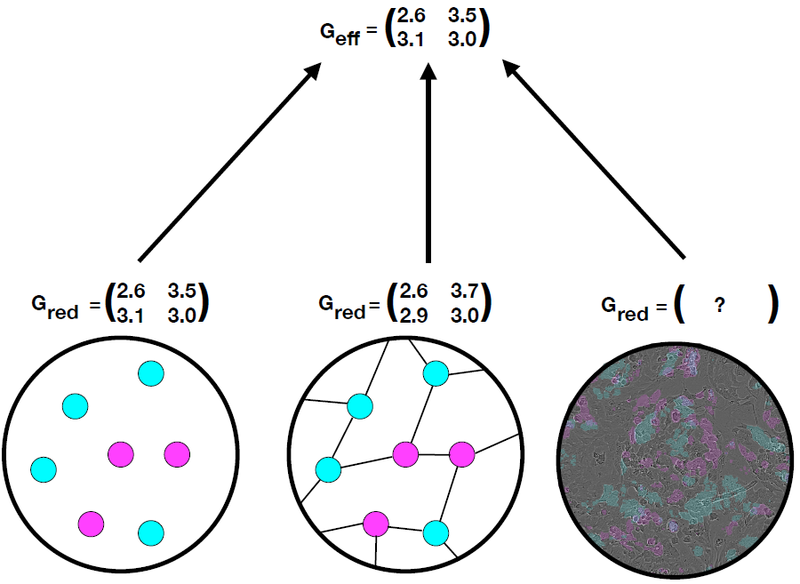 This EGT perspective has helped oncologists to express a number of interesting theoretical consequences of non-cell autonomous processes, but has only recently started to be translated into direct experimental work. And, of course, Marco realizes the importance of this experimental connection and has spearheaded the efforts in this direction (see Archetti, Ferraro & Christofori, 2015). For integrating theory and experiment on this front of somatic evolution we have a new promising tactic – abstraction. As I’ve discussed before, for a computer scientist, abstraction is a way to hide the complexity of a computer system. It is a way to make programs that can be used and re-used without having to re-write all the code for each new computer. In this sense an algorithm is an abstraction of the actual sequence of bit flips that carry out the physical process that is computation. To turn it around: the physical process carried out by your computer is then an implementation of some abstract algorithm. Abstraction and implementation are in some sense dual to each other. Abstract objects or processes are multiply-realizable by a number of concrete objects or processes. The concrete objects might differ from each other in various ways, but if the implementations are ‘correct’ then the ways in which they differ are irrelevant to the abstraction. The abstraction is less detailed than the implementation, but captures essential features precisely. It might seem like connecting more closely to experiment must always make a model less abstract. But this is not always the case: the act of measurement itself can be a way to abstract. This is achieved with phenomenological or effective (instead of reductive) theories. And I’ve discussed this before in the context of the game assay (see Kaznatcheev et al., 2019). In the case of the game assay, we achieved abstraction by focusing on the fitness of types rather than tokens. The focus on abstract types lets us absorb all the details of spatial structure, interaction length-scales, reproductive strategies, etc. into the measurement of the type fitness. It is nature that figures out the particular computation that transforms token fitness into type fitness (see the figure above for 3 examples) and we do not need to know it once we are working at the level of the abstract effective game: the abstract measurement is enough to derive the predictions of the model. A downside, of course, is that we cannot actually describe the specific way token fitness is translated into type fitness in our system. But future work can push the abstraction down, so that more details of the implementation – such as the effects of spatial structure – can be extracted (see Kaznatcheev 2017,2018). Basanta, D., Simon, M., Hatzikirou, H., & Deutsch, A. (2008b). Evolutionary game theory elucidates the role of glycolysis in glioma progression and invasion. Cell Proliferation, 41(6): 980-987. Kaznatcheev, A. (2018). Effective games and the confusion over spatial structure. Proceedings of the National Academy of Sciences, 201719031. Kaznatcheev, A., Peacock, J., Basanta, D., Marusyk, A., & Scott, J. G. (2019). Fibroblasts and Alectinib switch the evolutionary games played by non-small cell lung cancer. Nature Ecology & Evolution bioRxiv, 179259.